The Vichy Clarifying Charcoal Mask provides clear, clean skin and removes impurities such as pollution and dirt. 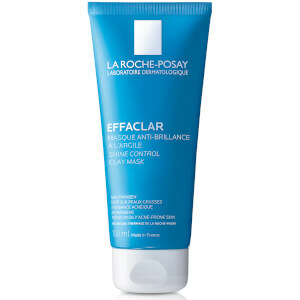 This face mask formulated with natural-origin charcoal, kaolin clay and Vichy Mineralizing Thermal Water. This black charcoal mask acts as a magnet, extracting dirt and toxins from the skin’s surface and reduces the look of pores. Skin affected by daily urban aggressors is rejuvenated and left feeling clean and hydrated by this facial mask. Natural-origin charcoal extracts dirt and toxins from pollution to the surface of the skin and then absorbs and removes them. Kaolin clay is a volcanic earth clay which has absorbing and soothing properties. Vichy Mineralizing Thermal Water is born in the French volcanoes and charged with 15 essential minerals to help strengthen the skin’s moisture barrier to help protect skin against external elements. 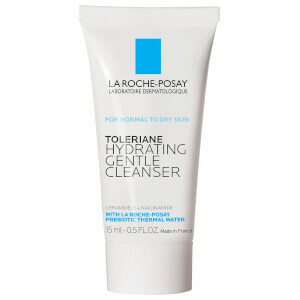 Apply an even thin layer on clean skin and leave on for 5 minutes. Rinse well with warm water. Use 1 to 2 times a week. Avoid eye and lip areas. In case of contact with eyes rinse them immediately and thoroughly. Aqua / Water/ Eau, Kaolin, Glycerin, Argilla / Magnesium Aluminum Silicate, Propanediol, Isononyl Isononanoate, Alcohol Denat., Cetearyl Alcohol, Ci 77499 / Iron Oxides, Stearyl Alcohol, Stearic Acid, Glyceryl Stearate Citrate, Cetearyl Glucoside, Myristic Acid, Sodium Citrate, Sodium Phospate, Sodium Dehydroacetate, Palmitic Acid, Phenoxyethanol, Tocopherol, Caprylyl Glycol, Citric Acid, Charcoal Powder, Spirulina Platensis Extract, Xanthan Gum, Dextrin, Polyglycerin-10, Polyglyceryl-10 Myristate, Polyglyceryl-10 Stearate, Parfum/Fragrance. 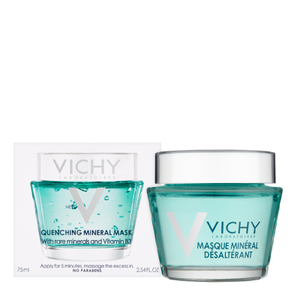 Vichy Hydrating Quenching Mineral Face Mask for Dry Skin with Vitamin B3, 2.54 Fl. Oz. 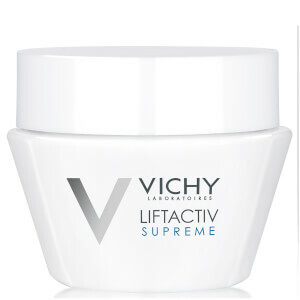 Vichy Mineral Pore Purifying Facial Clay Mask, 2.54 Fl. Oz.